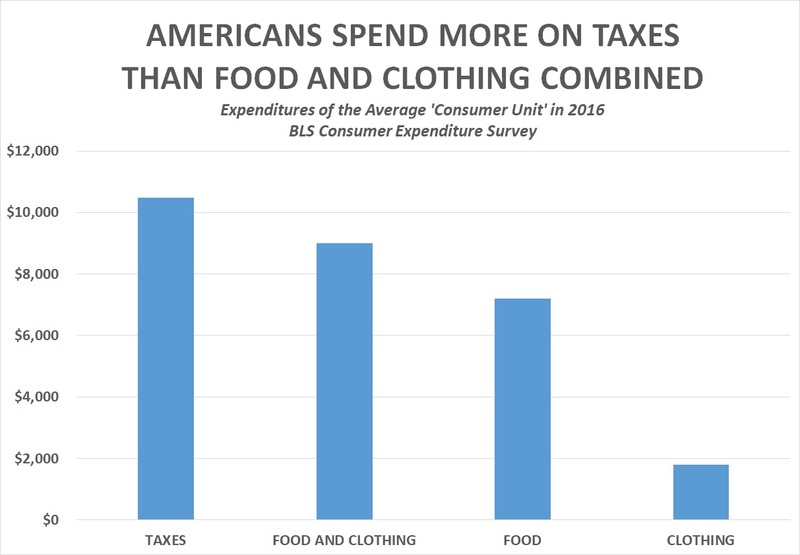 The tax-and-spending data was collected as part of the BLS’s Consumer Expenditure Survey, which is conducted for the BLS by the Census Bureau. The survey measures the expenditures and incomes of American consumers. The survey publishes the itemized expenditures of what it refers to as “consumer units,” which include “all members of a particular household who are related by blood, marriage, adoption, or other legal arrangements,” or “a person living alone or sharing a household with others or living as a roomer in a private home or lodging house or in a permanent living quarters in a hotel or motel, but who is financially independent,” or “two or more persons living together who use their income to make joint expenditure decisions.” The BLS said that a consumer unit generally refers to a family. In 2016, according to the survey, there were 129,549,000 “consumer units” in the United States. The average before-tax income of an American consumer unit was $74,664 for the year. The consumer unit then paid an average of $10,489 in personal taxes—including $8,367 in federal income taxes, $2,046 in state and local income taxes, and $75 in other taxes. Three years before that, in 2013, according to the survey, there were 125,670,000 “consumer units” in America. The average before-tax income of these consumer units that year was $63,784. In 2013, consumer units paid an average of $7,432 in taxes—including $5,743 in federal income taxes, $1,629 in state and local income taxes, and $60 in other taxes. 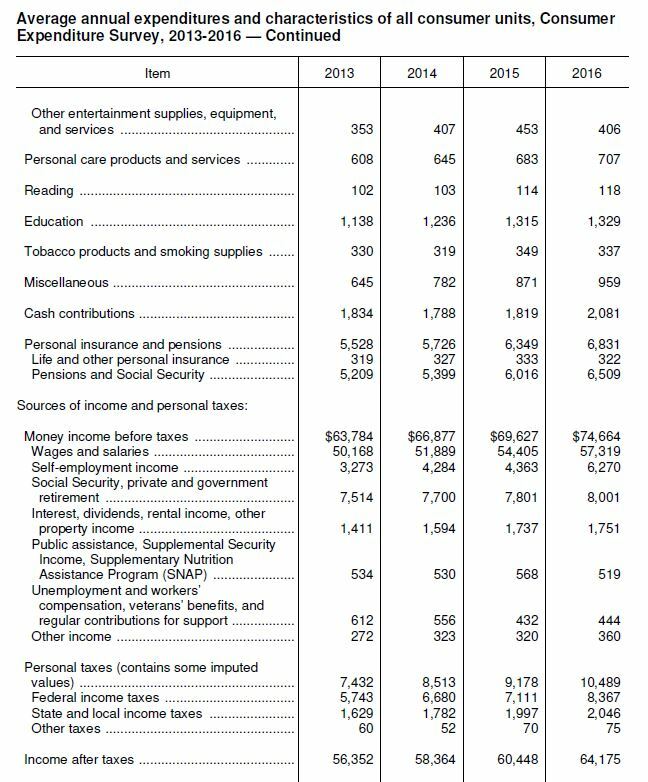 From 2013 to 2016, overall personal taxes climbed from $7,432 to $10,489—an increase of $3,057 or 41.13 percent. Federal income taxes climbed from $5,743 to $8,367—an increase of $2,624 or 45.7%. State and local income taxes climbed from $1,629 to $2,046—an increase of $417 or 25.6 percent. Other taxes climbed from $60 to $75—an increase of $15 or 25 percent. The biggest single expenditure by “consumer units” in 2016—and the only one that exceeded taxes—was “housing,” which cost the average consumer unit $18,886 during the year. That included $11,128 for the “shelter” itself, $3,884 for utilities fuel and public services, $1,384 for household operations, $160 for housekeeping supplies, and $1,829 for household furnishings and equipment. Under the food at home category, the average consumer unit spent $890 on “meat, poultry, fish and eggs," $783 on “fruits and vegetables," $410 on "dairy products," and $393 on "non-alcoholic beverages." The $10,489 that the average consumer unit spent on taxes in 2016 was 13.4 times as much as the $783 it spent on fruits and vegetables.